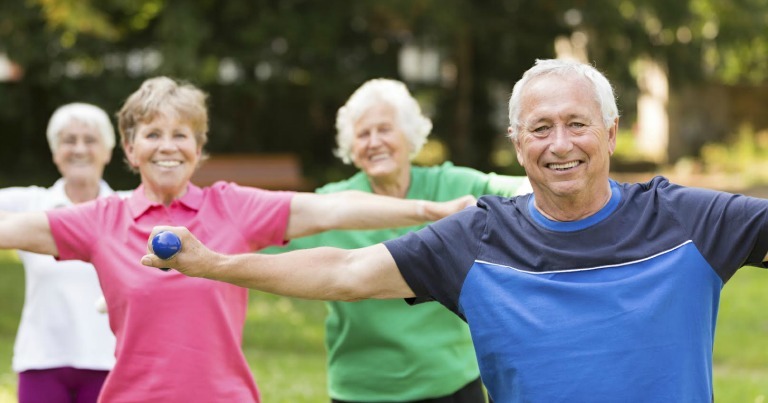 There are a number of ways that a tailored exercise program can help relieve the pain and fatigue of arthritis and preserve joint structure and function, in the process. Incidentally, the term arthritis describes more than 100 rheumatic diseases and related conditions that cause pain, stiffness and swelling in the joints and connective tissues. Knowing the type of arthritis you have and its symptoms, it’s possible to develop an exercise regimen that will lessen the effects of your particular condition, while helping to regain optimal health. With a regular exercise program, you may find that you have improved sleep and better overall function. There are typically three levels of exercises recommended for people living with arthritis: therapeutic, recreational, and competitive. Therapeutic exercises are a first step if you’ve been inactive and concentrate on specific joints or parts of the body affected by arthritis, while recreational activity includes controlled exercises like walking, running, swimming and skiing. Competitive exercises are done with greater skill, training, and intensity and may not be recommended for people with joint problems or inflammatory arthritis. For those who suffer from osteoarthritis, moderate regular strengthening and exercise can help improve joint motion and function and cartilage health. It’s important to remember that the right warm-up routine can help avoid injury. The American Orthopedic Society for Sports Medicine suggests exercises like an arm, shoulder, and knee stretches, squats and side lifts, and calf raises for flexibility. Muscle strengthening activities include lifting weights, working with resistance bands, and resistance exercises. Indoor/outdoor walking and treadmills are beneficial for aerobic exercise. Even various types of yoga can help build strength and endurance, while allowing more range of motion to help alleviate joint pain and stress. People who include exercise in their treatment of arthritis are not only happier and healthier, but may also live longer lives. Consult your physician or therapist to find out what routine is best for you or check out other alternative therapy offered at Freedom Home Care.